Friday took me east to Solvær, first for a presentation by Tormod Granheim on climbing on 4000m peaks in the Alps, and then, on Saturday, an avalanche course up on Vesterålen. After the course ended in mid afternoon, we caught the ferry back to Lofoten with more adventures in mind: Matmora. The sun was setting as we left the parking lot and headed up through the deep snow. Eventually, after some hours we cleared the trees and arrived on the flat northern ridge with leads to Matmora. In the darkness we setup camp and waited for what the morning would bring. I was hoping for some nice pink light, but dawn broke flat and grey. Tired, I didn’t crawl out of my sleeping bag until after 8:00. Soon, we were under way through the deep snow to Delpheia and then up the ever steepening and narrowing ridge. This image is on the descent from Delpheia just before the route begins to climb again. The summit is visible in the distance, hidden in the clouds and still a couple hours away. 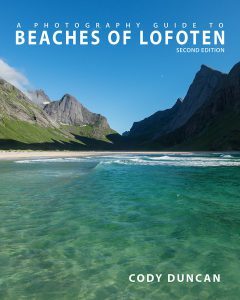 This image is a result of the necessity for flexibility in your plans when traveling to Lofoten – winter or summer. My goal for the day had originally been for Matmora, but as had been the trend for most of my days on Lofoten thus far, the summit remained hidden in a layer of clouds. Luckily, Festvågtind (see hiking guide HERE), near Henningsvær was clouds free – or at least when I decided to start hiking. I initially arrived at the summit at the same time as a passing snow storm. But unlike the higher surrounding mountains, the clouds would quickly pass revealing what looked like a fantastic summer day if you were to ignore the near freezing temperatures on the summit. This is the view from the summit of Festvågtind (hiking guide HERE) on turbulent summer evening. Over the hours I spent on the summit there was a constant transition between sun and snow. Wave after wave of clouds and snow flurries were approaching over the sea from the west, creating an interesting dance of light and shadow. I have my Fuji xt-1 set up shooting time lapse sequences of the quickly changing conditions. But it was one of those days in which I had a half dozen cameras, as there was interesting light and clouds in almost every direction. 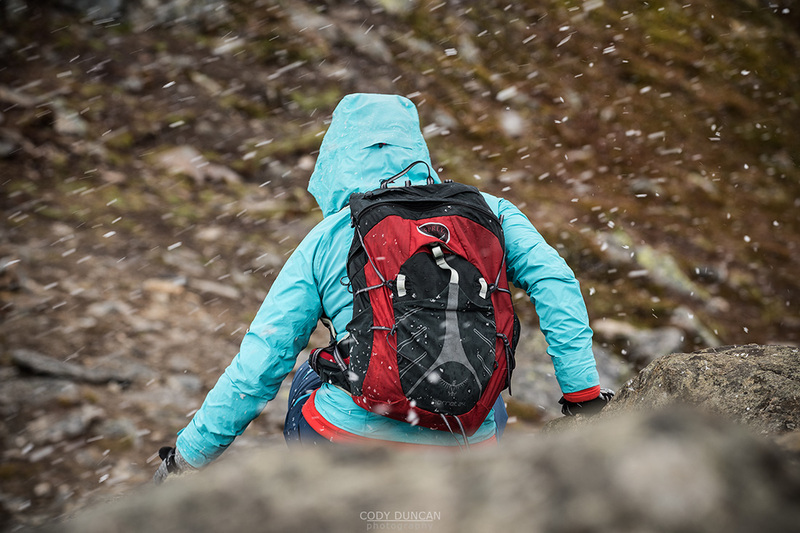 In early summer it’s important to be prepared for sometimes winter-like conditions if heading out into the mountains. 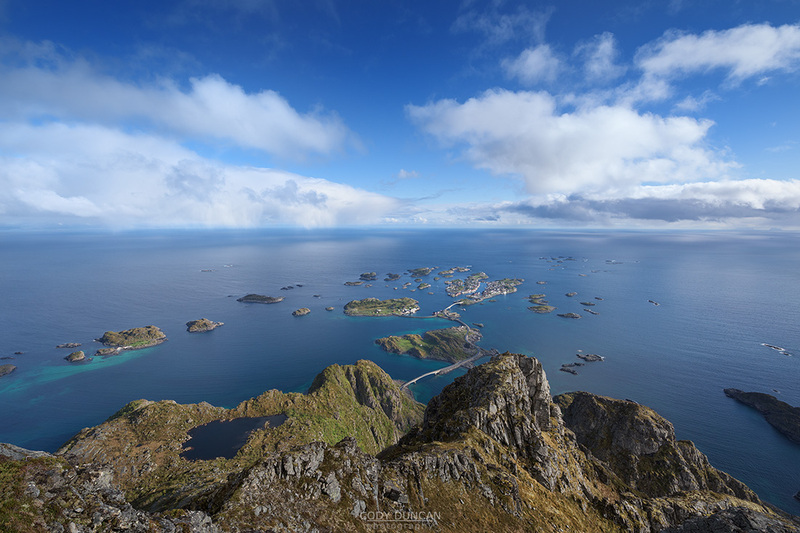 In the typical changeable nature of the weather on Lofoten, we had started the hike under a nice sunny blue sky. By the time we reached the summit, we had to sit on the leeward side of the large summit boulders to wait out the first of many snow flurries passing the mountains. Even as one band of snow passed, the next would already be lined up on the horizon, approaching from Stamsund to the west. But as quickly as the snow would arrive, it would leave again and the sun would be shining brightly. Another Image from my last night of northern lights in September 2014. 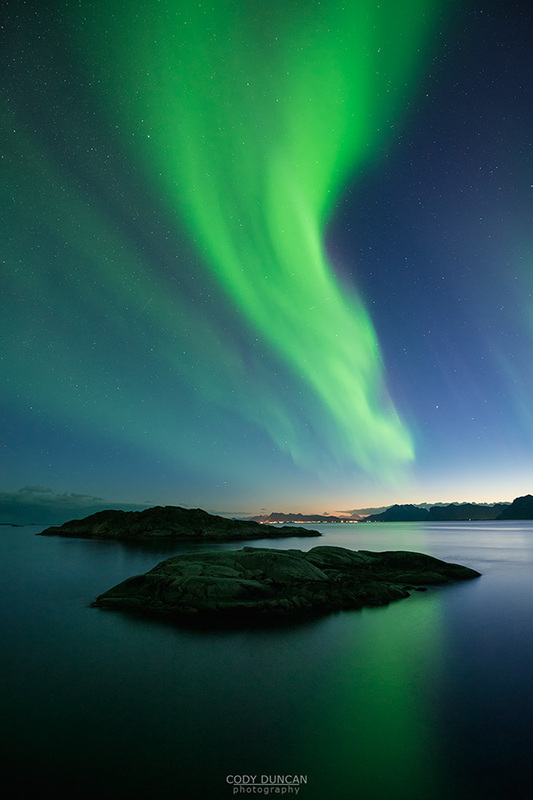 What started out as a nice display of auroras, finished with the sky completely full of light! Even here, at 14mm, my entire frame was filled with light. And even then, I was still left to look up ever further, with auroras filling nearly every part of the sky. 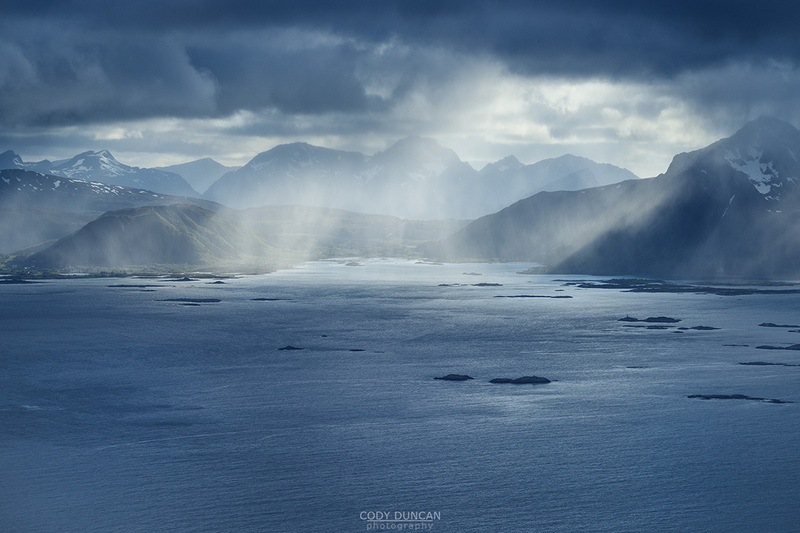 Probably one of my most memorable nights ever, and a good end to over a month on Lofoten. 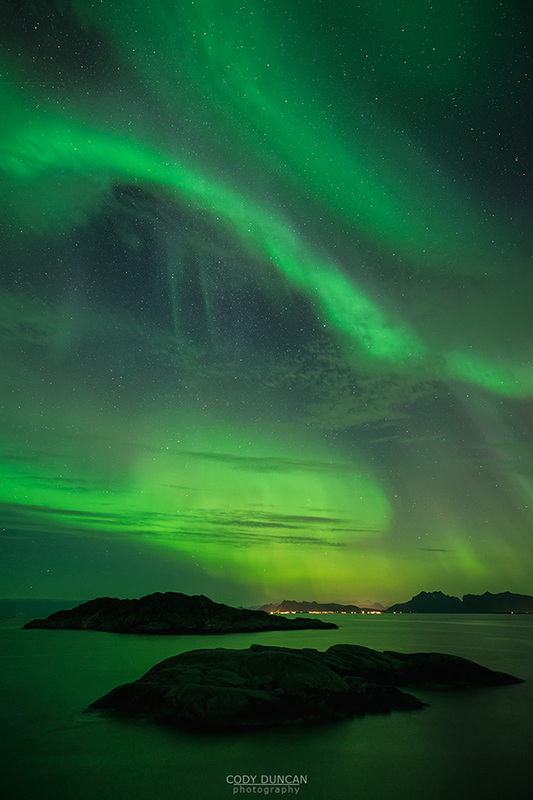 My last view of northern lights in what had been an absolutely fantastic month of September 2014; probably the best month I’ve ever had aurora watching on Lofoten. I had camped at this spot on a few previous nights, yet the lights had been elusive. So when they finally showed up for me at this spot, I was more than happy. Especially so, in that they were early enough in the night to still have some glow on the horizon, which helps the images in autumn when there is no snow on the mountains. With a forecast of some pretty heavy storms to hit the islands in the following days, we took advantage of what would likely be the last night of clear weather for the trip and camped out on the coast near Henningsvær. And as luck would have it, just after dark, a faint glow began to appear in the western sky, before finally erupting in almost 180˚ of aurora which lasted for hours. A good farewell to a month in the north. 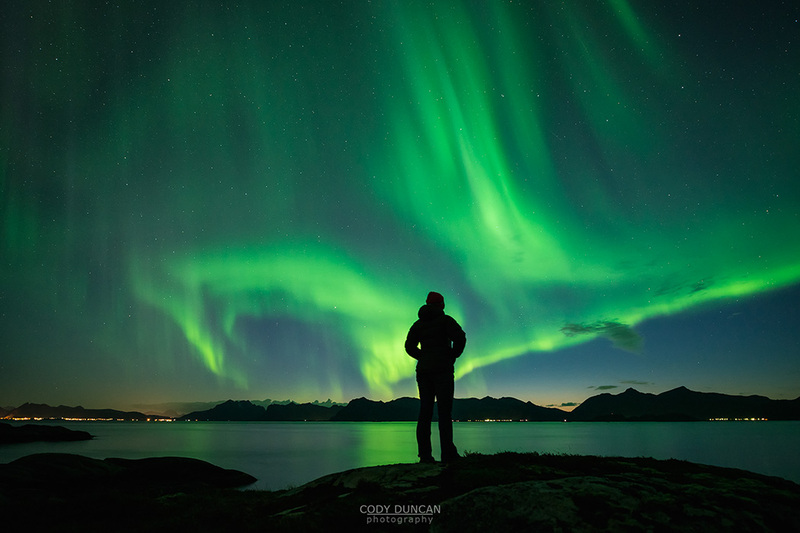 Photographing the northern lights in the autumn is a different experience than winter. 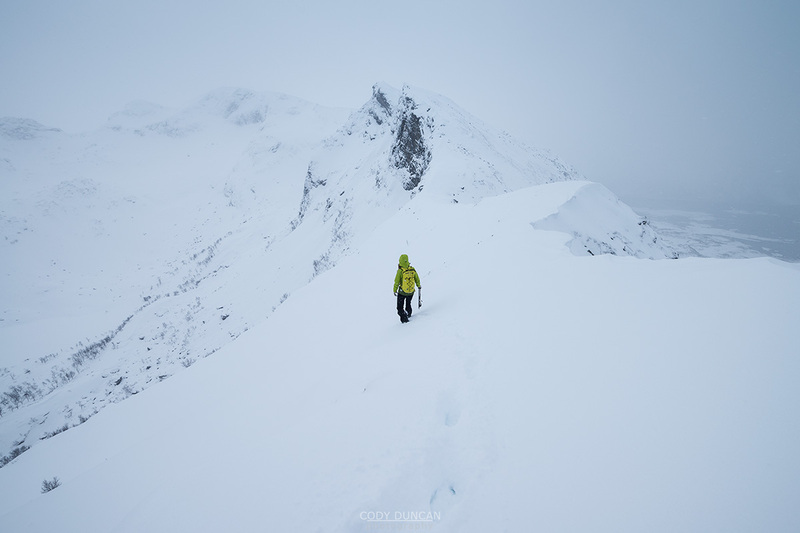 There is no need to polar expedition style down jackets, as at least on Lofoten, the temperatures often remain quite mild – though it did dip down to freezing on a couple nights. But what I don’t like as much is the lack of snow. If there is no moonlight, then all you will have are black mountain silhouettes in the foreground unless you can find a nice piece of water for a reflection and some separation. Day 4, mountain 4. After having dropped my camera in a lake in Sweden a few weeks earlier, by the time I received a new one I only had a week left on Lofoten. Luckily the autumn of 2013 was a calm and mild one for the most part and once I had a new camera, it was up to the mountains for four consecutive days before the weather finally deteriorated. The 707 meter high Kroktind is a somewhat obscure peak in the Sydalen area of Austvågøy. But with legs getting a bit sore, my Swiss hiking partner Monika and I both figured this would be an interesting hike for the day. By the time we reached the summit a layer of white cloud was beginning to conceal the sun. But being late September, it was t-shirt weather on the summit, as we sat and watched sea eagle circling around on nearby thermals. I nearly every direction mountains rose into the distance. And there were even some reflections of glaciers, somewhere far off on the Norwegian mainland. 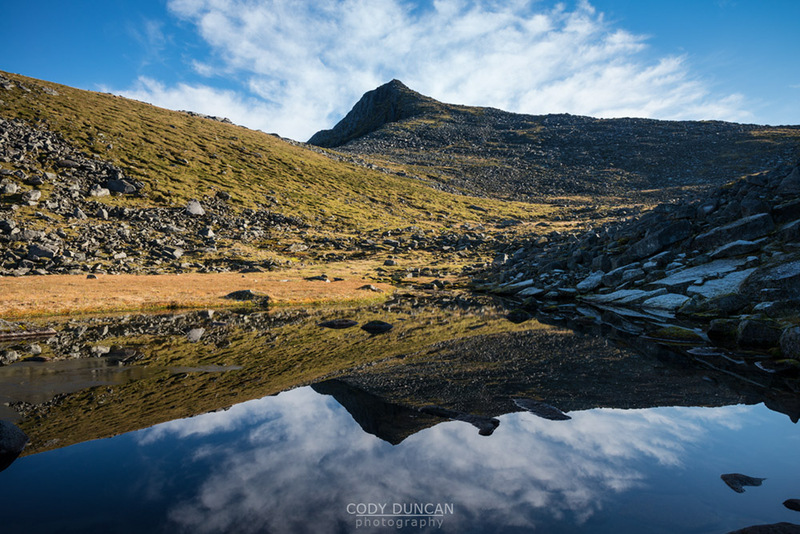 Photo: Kroktinden (707m) reflects in small pond, Austvågøy, Lofoten Islands, Norway. I have just added a new hiking page for the mountain peak Kroktind, located on Austvågøy. – CLICK HERE – to checkout the guide. 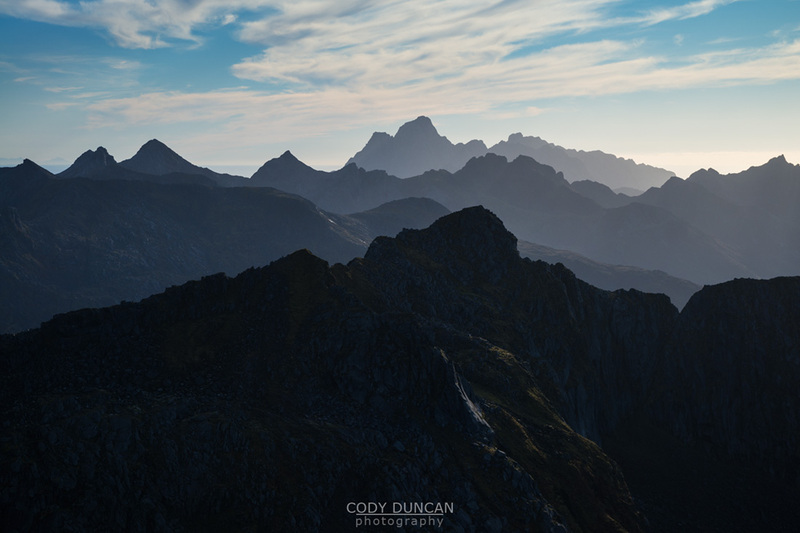 Photo: View from the summit of Kroktind over rugged mountain peaks towards the distant Vågakellen, Austvågøy, Lofoten Islands, Norway. 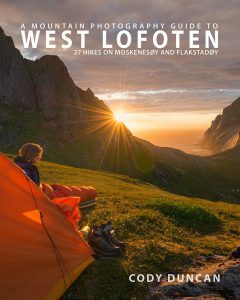 As the last light faded from the short February day I found myself passing Vatterfjordpollen on the way back towards Svolvær and in search for a car-bivy spot for the night. I was actually thinking of maybe checking out the Lofoten meeting of the Norwegian Alpine Club, but the hotel looked a bit to posh for me, as so I passed on by. 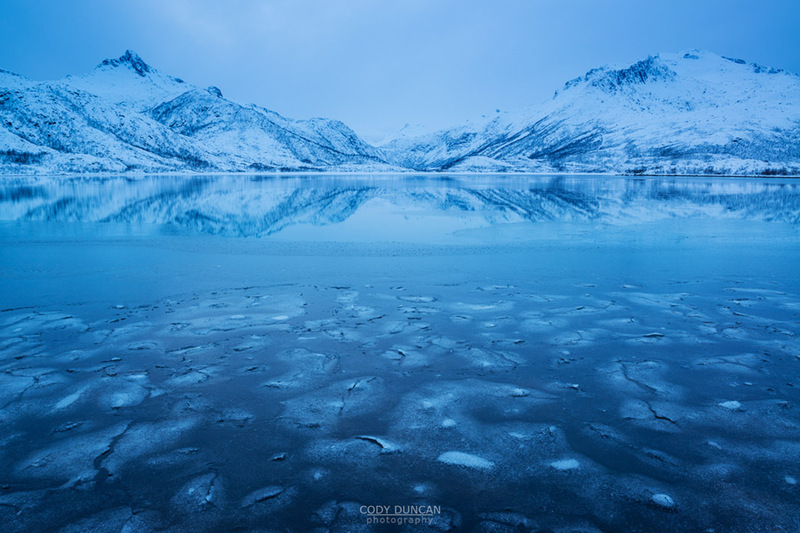 When the temperature is sufficiently cold, some of the tidal fjords will begin to freeze. Sometimes this creates something interesting and sometimes not. The days thus far in the heavy overcast sky had mostly been a waste. Another ‘weather’ day for Lofoten. But in the darkening sky I wandered down to the fjord’s edge. By far from my best image from the trip, in those first days on the islands I’m always anxious to take a picture of something, anything. And as I drive in circles and see the needle on the gas tank fall, knowing next time I pull up to the gas station I’m going to blow through $100+, that desperation grows even further. Sometimes I don’t have the patience to park in one place and read the day away, even though I know I should.